How to replace an existing image in a worksheet using C#,VB.NET? This article explains how to replace an existing image in a worksheet in XlsIO using C#/VB.NET. How to replace existing image? Images are inserted in worksheet using the position in that worksheet. To replace an existing image but within the bounds of the old one, we need to use the size and position of the old image. To replace the existing image using XlsIO, you need to follow the below steps. We need to get the old image size and position information. 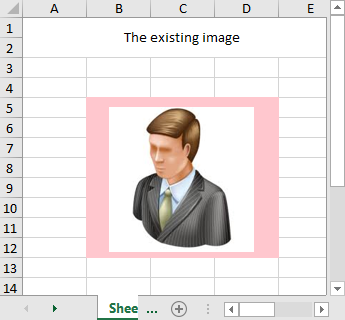 The following screenshot shows the existing image in a worksheet. 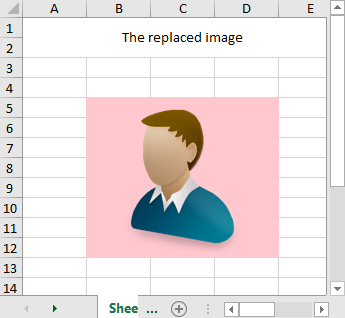 Add the new image in the worksheet and set the size and position of the old image. To know more about working with images in XlsIO, please refer the documentation. The following C#/VB.NET complete code snippet shows the replacement of an existing image in a worksheet. The following screenshot shows the output of the image in a worksheet after the existing image is replaced.